Go to Ireland and enjoy a sumptuous feast for the senses. Each county of Ireland offers stunning scenery. The south of Ireland, Kerry and Cork are often visited for three reasons: whale and dolphin spotting, beach holidays and gourmet breaks. That rugged and deeply indented coastline of the south, warmed by the Gulf Stream is a natural paradise. the cliffs and rocks are home to thousands of birds. Go to Baltimore and take a ferry boat ride to Sherkin Island to see puffins and seals in the natural habitats. The sunsets over the Atlantic Ocean streak the sky with vibrant colour. Enjoy the freshest sea food, the very best farm food and the laid back attitude of the Irish who always have time to spare and a 'twinkle in their eye'. 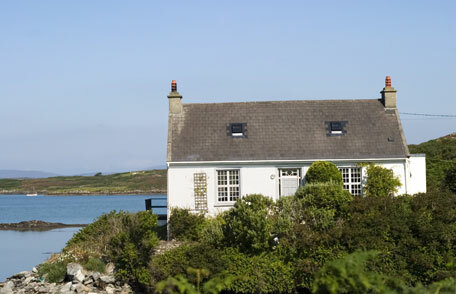 As anywhere, there is a variety of cottages to rent for 2 people in Ireland; simple whitewashed cottages in the country, luxury cottages for 2 in Ireland, cottages with a hot tub in ireland, Cottages that have their own swimming pool and much more. Ireland is well known for its fishing, golf, horse riding, and racing. All of these sports can be sampled during your holiday in addition to kayaking, sailing, cycling, quad biking and more. You may like to stay in a cottage near the beach or even on a beach in Ireland. Such places actually exist. Begin by deciding what you would like to do most of the time in Ireland. If you plan to visit Dublin or Cork on a city break then you should really aim to obtain accommodation in the city to be on hand and make the most of your visit instead of wasting time travelling. On the other hand, some people like to tour and driving is an intrinsic part of their holiday. Galway is very beautiful as is the Beara Peninsula in County Cork and the south west. Everyone has their favourite part of Ireland. perhaps this year you will be able to name yours.